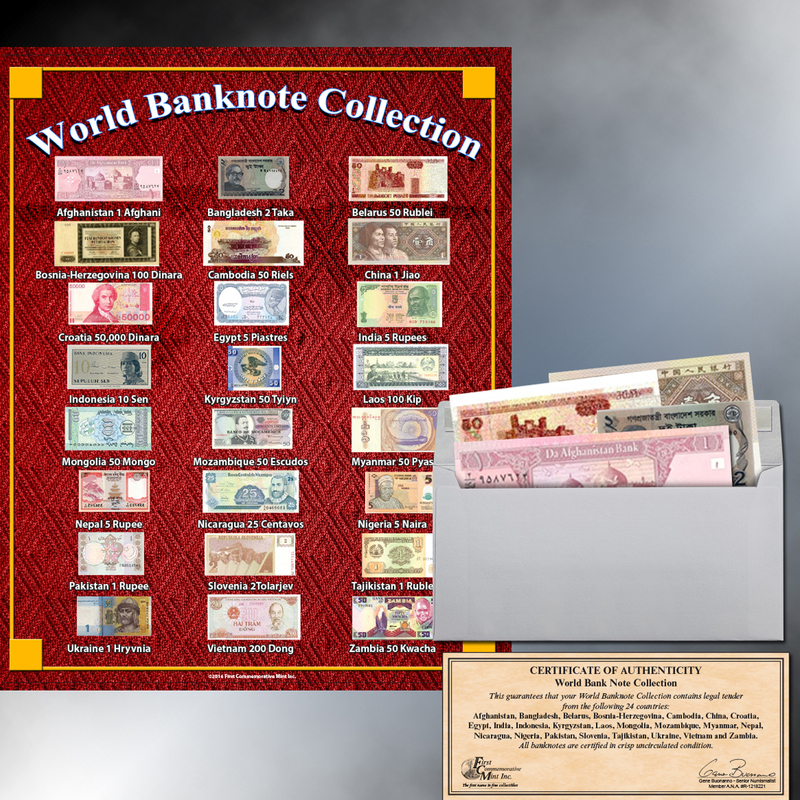 The collection features 24 different bank notes from 24 different nations around the world. The notes are official legal tender that were issued by the respective governments. The notes come from Europe, Asia, Africa, and the Americas – and together, they take you on a fascinating journey around the world. Each note is colorful and features symbols of the nation as well as people and places that represent the nation’s history and culture. The people depicted include Mahatma Gandhi on India’s 5 Rupees, Queen Nefertiti on Egypt’s 5 Piastres, and Prince Novgorod on Ukraine’s 1 Hryvnia. There are also important national buildings, scenes of local countryside, and other images that uniquely represent the nations of issue. The notes literally take you around the world as you embark on a journey from A to Z – Afghanistan to Zambia! In addition to the colors and images, the notes also represent a wonderful array of sizes and denominations – from Bangladesh’s Taka to Laos’s Kip, Tajikistan’s Ruble, Vietnam’s Dong, and Zambia’s Kwacha. Each note is a historic artifact in its own right, and together they make a collection of unprecedented importance that would be virtually impossible to assemble on your own. The nations also range from the ancient (Egypt, China, India, Mongolia) to those that emerged within our lifetimes (Bangladesh, Belarus, Croatia, Slovenia) … and many more in between. 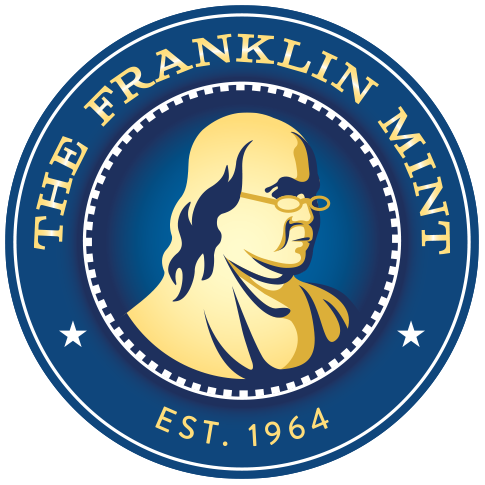 Each note is in original Uncirculated condition, exactly as issued by the governments around the world – allowing you to appreciate the beautiful designs and enjoy the craftsmanship that is required to produce such stunning works of art. 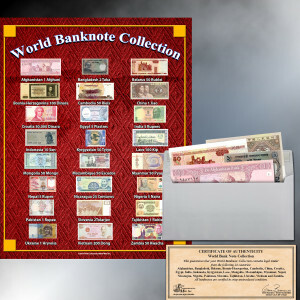 The collection comes with a full-color 8” x 10” identification chart showing each note, the nation of issue, and the denomination.